Since AISP’s beginning in 2012, 51 interns have participated in the program. Of those, 25 have accepted job offers from participating firms. We are pleased to announce that, so far, seven of the twelve interns from the 2015 AISP session have accepted job offers from the participating firms. That means that over the four years, 19 out of 40 interns have found employment with a participating firm. Plus, a few other interns have been able to connect with other CPA firms due to their participation in the program. This entry was posted in General information on September 4, 2015 by AISP Coordinator. Welcome to the AISP 2015 Interns! Tuesday, June 2 was orientation day. After a brief overview of how the eight-week session would work, the interns had a chance to meet individually with representatives from each of the six firms in 15-minute speed meeting sessions. The interns will spend the next six days getting an “inside look” at each firm, along with training on various accounting topics. The interns will continue to learn about various accounting topics, such as sales tax, payroll tax, QuickBooks, S-corp tax, audit and valuations, throughout the eight-week program. At the end of the program, the interns experience a couple of weeks of hands-on/shadowing work to better understand what happens on a day-to-day basis at the firms. This entry was posted in General information on June 3, 2015 by AISP Coordinator. APPLICATION DEADLINE WAS FEBRUARY 15, 2015. We selected twelve interns who are excited to start the program on June 2. This entry was posted in General information on November 5, 2014 by AISP Coordinator. 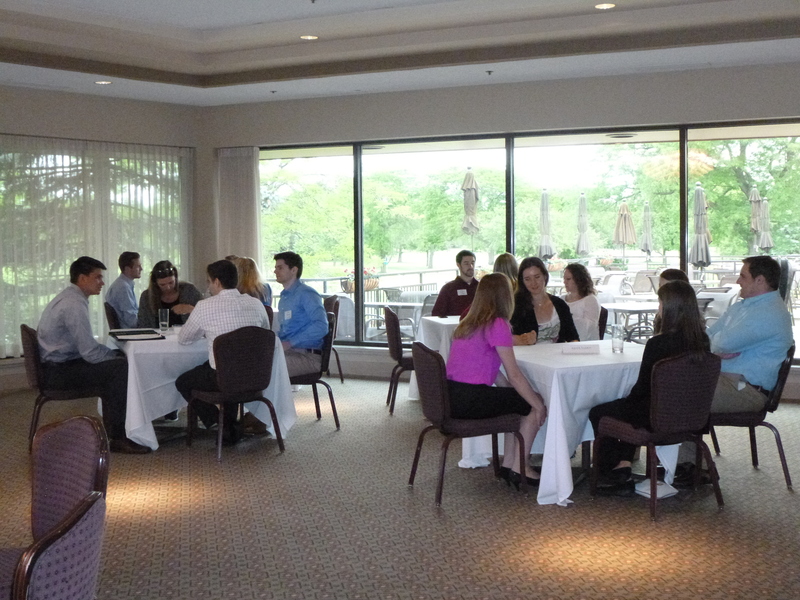 The 2014 AISP session started on June 3, 2014, with an orientation session at Ravinia Green Country Club. After an informal meet and greet over breakfast, the interns received a general overview of the eight-week program. Throughout the program, the interns will spend time at each of the six participating firms learning the ins and outs of life at small to midsize CPA firms. 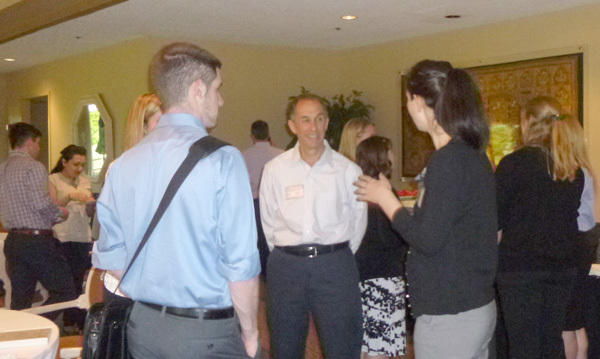 An informal meet and greet preceded the program overview at the 2014 AISP orientation day. 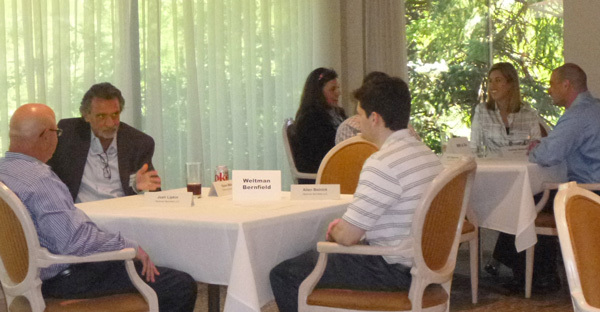 Following the overview, the interns took part in “speed meeting” where they moved from table to table to talk with staff members and partners from the six participating firms. This allowed for both the firms and the interns to get to know each other in a more intimate setting. As an added plus, some of the staff from the different firms were alumni from previous AISP sessions who could answer additional questions about the program. Samiyah Siddiqui (center), a 2013 AISP alum, represented The Hechtman Group during the “speed meeting” sessions. Also pictured are 2014 intern Matt Wydra (left) and Steve Kunz from The Hechtman Group. During the “speed meeting” sessions, interns were able to talk individually with partners and staff from the six participating firms. 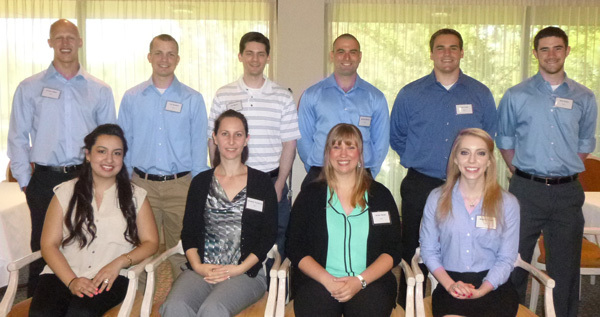 The 2014 AISP interns: (front row, l-r) Sandra Ramirez, Gergana Tsvetkova, Ashley Barak, Meghan Creed, (back row, l-r) Corey Lettieri, Tim Reichert, Tim Martin, Michael Bolnick, Sean Tews and Matt Wydra. This entry was posted in General information on June 4, 2014 by AISP Coordinator. Watch for more information as we near our start date. This entry was posted in General information on May 1, 2014 by AISP Coordinator. Having received over 60 applications and inquiries for the Accounting Intern Scholarship Program, the AISP selection committee is now in the final stages of reviewing applications and making final selections. Interns will be notified of their status in early March. Watch for details. This entry was posted in General information on February 24, 2014 by AISP Coordinator.